Last year I did my first demo for the NES, which was some sprites from The Simpsons cartoon. 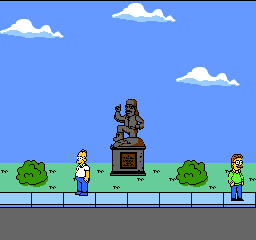 What you don't know I was slowly making tons of Simpsons sprites, just for fun. I decided to revamp my previous demo to show not 4 but 18 characters, with a proper background. Actually I have here 22 characters done, but this is more I can fit in a NES PPU RAM (Sprite RAM). Yes, I could reload the sprites on RAM, but I got bored of this demo actually. The sprites moves left and right on screen, and every time one exit, a new character is generated randomly. I'll not tell what characters are in this demo. Some are very rare to appear. This demo is the proof that NES can handle a good Simpsons looking game. Run on your fav NES emulator. Some good news : I'm working on another sprite demo, this time is something you don't expect to see on NES hardware. One of my best sprite work so far and many people will not believe it's running on NES.